When I make this dish at home, I always take the time to make my own chicken stock. The difference is amazing (see recipe for Egg Drop Soup). Canned, low sodium broth can be used, but be sure to adjust the added salt in the recipe. Making my own stock for this dish is very practical; I buy two whole, fresh chickens and disjoint, boning out the breast meat for the lo mein. I add what’s left – bones, skin, leg quarters, to a pot of water and simmer for a few hours. (I eat the boiled meat with a little soy sauce as a snack while I cook!) I keep the pot of stock simmering next to the wok, so I can quickly ladle the stock in as I need it. Keeping it hot helps speed up the cooking process. Store any remaining stock for later use. Bring to a boil and cool thoroughly before refrigerating or freezing. Any leftover boiled chicken can be used for salads or sandwiches. This is a very flexible recipe; you may substitute any number of vegetables and/or meats. Try shrimp, pork or beef flank steak. Adjust cooking times according to vegetables added; cook heartier items first, keeping in mind everything will continue cooking for a few minutes after being removed from heat. 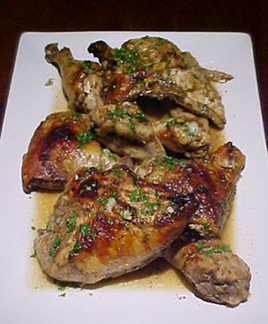 Marinate chicken with 1 tbl light soy sauce, 1 tsp sesame oil, salt and pepper to taste. Set aside. Blanch thick chinese broccoli stalks in boiling salted water until just tender. Rinse in cold water and set aside. Dissolve cornstarch in one cup of stock or water. Arrange all ingredients near cooking area. Heat 1 tbl oil in cast iron or large skillet over medium heat. Toss 1/3 cooked noodles with 1 tsp dark soy sauce and 1/2 tsp brown sugar. Add noodles to skillet, spreading noodles into pancake shape, and pan fry until crispy on both sides, adding more oil as needed. Do not burn. Remove to pan in warm oven. Repeat with remaining noodles, in batches, until all are browned and crispy. Keep noodles warm in oven until ready to serve. Heat 1 tbl oil in another large skillet or wok. Add chicken and brown all over, cooking in batches if necessary. 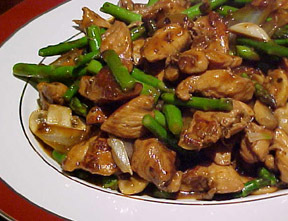 Remove chicken from wok to a large bowl. Add another tbl oil to wok and add garlic, onion, ginger, chinese broccoli, celery, and carrots. Sprinkle with a dash of brown sugar, salt and white pepper. Stir fry until garlic becomes slightly browned and fragrant, then remove all items to bowl containing chicken. 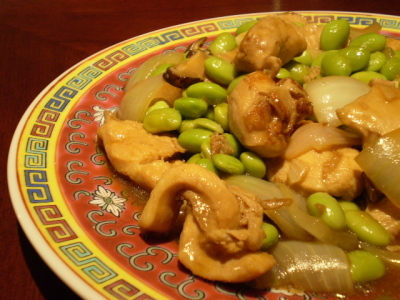 Add another tbl oil to wok and add snow peas, baby corn, mushrooms, nappa and bok choy. Sprinkle with dash of brown sugar. Stir fry until bok choy becomes fork-tender, about one minute. Add reserved items back into wok and toss to combine. Add oyster sauce, dark soy sauce and toss. Add about two cups of chicken stock. Bring to boil, and add cornstarch slurry. Stir until thickened. If gravy becomes too thick, add more stock. Check seasonings, add 1 tsp sesame oil, and toss once more. Place noodles on large serving platter. 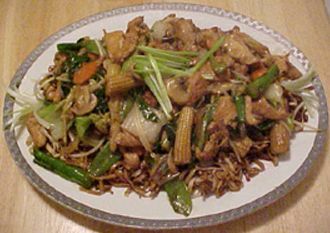 Ladle chicken mixture over crispy noodles. Garnish with green onions, if desired. Serve immediately.